It's Chelsea: The best BB cream ever? Back when the BB cream craze was just starting a few years ago, It was the first and last BB cream I will ever try (probably not the latter but it sounded dramatic as I was typing!) and I have never looked back. I bought it one summer when I was in Hong Kong, and if you live or have ever been there during summer, you definitely know not wear foundation. The sticky and humid weather conditions would make any foundation slide right off your face, nice! Anyway, I needed some coverage on my face so I walked into a Missha cosmetics shop (probably trying to find anywhere with aircon to get away from the oven like heat on the streets) and the girl in the shop recommended it to me. At the time they only did two colours, number 21 and 23. She explained 21 was for people who wanted to look more pale than they are and 23 was a more natural and realistic colour. Can you guess which one I went for? Yep, 23. No one wants to look like a ghost. Onto the actual review of the product... I think me telling you that I've repurchased at least 6 or 7 bottles since then says it all (I also have two spares incase of running out!). You may have heard that BB creams have a reputation of having a grey tinge to it at first? This one doesn't. Although the longer you leave it once you've applied it, the better and more natural it looks. As I'm a weird colour at the moment, I'm having to mix numbers 21 and 23 together to get the perfect match! I used to rub it in with my fingers until about just over a year ago, when I discovered the Real Techniques Expert face brush. These two go together like milk & cereal, peanut butter & strawberry jam, tea & biscuits... Etc. It literally takes me seconds to buff it all in and then a minute to add concealer to some marks that I may have missed. This is perfect if you have blemishes on your face but don't want to cake foundation on to cover up. So if you want to get your hands on this (I highly recommend that you should) you can buy it from koreankosmetics.co.uk. It's £23 but one tube lasts me almost a year so definitely worth the investment! 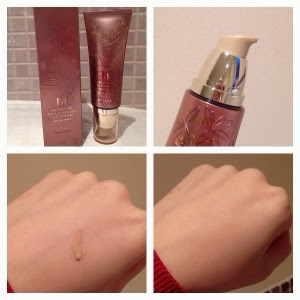 I was thinking about trying other Missha products soon as I just discovered this website! I tend to use a shade that looks more natural as well, even though I'd love a brighter skin tone. Thanks for sharing dear.